In 2015, fintech funding in Asia hit a record of US$4.52 billion across 130 deals, a rise attributed to the 17 US$50 million+ investments into the likes of One97, Dianrong, and BankBazaar, according to a new report from CB Insights and KPMG. Released yesterday, “The Pulse of Fintech, 2015 In Review” gives an analysis of the state of global fintech funding. “The evolving needs of digitally savvy consumers and the drive for efficiency, not least to meet regulatory and compliance costs, is propelling innovation in financial services like never before — and investors are taking notice,” Mead said in a statement. 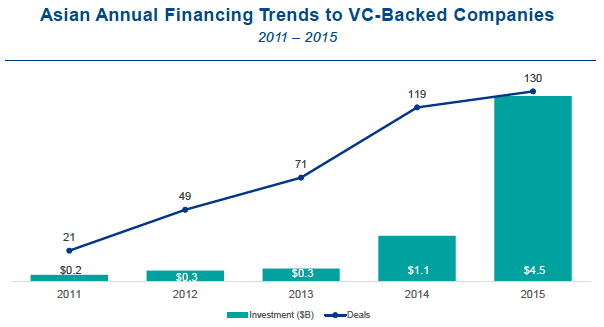 In 2015, Asia’s fintech investment jumped significantly, quadrupling 2014’s funding. While China and India remains leaders in the region, Hong Kong and Singapore are quickly emerging as fintech hubs as well, thanks to governmental support. Corporates are driving the trend, participating in 40% of all financing deals to Asian VC-backed financial companies in Q4’15, and nearly half of all deals in Q3’15. As fintech emerges in Asia, deal activity has shifted toward the mid-stage. In Q4’15, seed deal share declined to a 5-quarter low of 16%, compared with 31% in Q4’14 and 39% in Q1’15. Founded in 1983, Accel Partners is a leading early and growth-stage venture capital firm based in Palo Alto, California founded by Peter Thiel. Accel has invested in the likes of WorldRemit, peerTransfer, Circle, Prosper, Wonga, Lenddo, CAN Capital, YapStone, SuperDerivatives, Kensho, Funding Circle, PillPack, Coverfox Insurance, and Bangalore-based Scripbox. East Ventures is an early stage VC firm based in Tokyo. The firm focuses on companies based in Southeast Asia and Japan that are offering consumer Internet and mobile products. East Ventures has invested in StockRadars, a Thailand-based service providing mobile-based analytics and insight for trading, Indonesia’s Jurnal and Thailand’s Omise. Founded in 1972, Sequoia Capital is venture capital firm focusing on teams and companies tackling sectors such as energy, financial, health care, Internet and mobile. Sequoia Capital manages 8 funds with a total value of about US$2.5 billion funds plus more than US$4 billion RMB funds. 500 Startups is a global venture capital seed fund and startup accelerator based in Silicon Valley with ~US$200 million in assets under management. 500 Startups has recently launched a US$10 million fund to invest in Vietnamese startups. The firm is also planning to raise the same amount but for another fund dedicated to Japan. 500 Startups has invested in Thai Omise, Indian Instamojo, Kuala Lumpur’s iMoney.my, Intelligent Money Singapore, and Japan’s Exchange Corporation and Paidy. Sequoia Capital’s Indian fund is one of Asia’s most prolific venture capital firms. Life.Sreda is a growth-stage fintech VC fund based in Singapore. Prior to relocating to Singapore, Life.Sreda was based in Moscow. Life.Sreda has invested in Vietnam’s SoftPay Mobile International, Singapore’s Fastacash, Simple, Moven, Fidor and Anthemis. Based in Singapore, Golden Gate Ventures is a seed stage fund investing in early stage Internet startups in Southeast Asia. Golden Gate Ventures has invested in Singaporean Coda Payments, Japanese Ayannah, Filipino Lenddo, and MoneySmart.sg. CyberAgent Ventures is a Japanese VC focusing on early and late-stage investments. The firm invests in Internet businesses from Asia. CyberAgent Ventures has invested in Bangkok-based SiamSquared Technologies, Japan’s StockRadars, Exchange Corporation and Paidy, Singapore’s Codapay, Vietnam’s Baokim, and China’s hdtMEDIA. Founded in 1993, IDG Capital Partners was one of the first foreign venture capital firms to enter the Chinese market and focus exclusively on Chinese companies. IDG Capital Partners provides seed, venture, and growth-stage funding. IDG Capital Partners has invested in Wacai, a personal finance management service, Wecash, a China-based big data credit assessment platform, Estide, and payment network Ripple. Founded in 2010, Blume Ventures is an angel and seed venture fund based in Mumbai, India, focusing on Asian tech-focused/tech-enabled ventures. Blume Ventures has invested in the like of India’s payments solution provider Instamojo, and multi-bank peer-to-peer payments app Chillr. Featured image: Bangkok, via Pixabay.